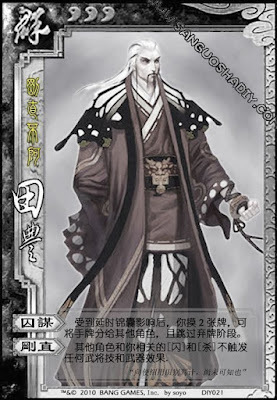 When Tian Feng is affected by a delay tool card, he draws two. He then can give cards from his hand to any player and skip his discard phase. When Tian Feng attacks or is attacked, neither weapon abilities nor character abilities can activate. Tian Feng must give at least one card away to skip his discard phase. The range of the weapon is still used, but the additional ability is disregarded.